Algorithms to use when painting on the canvas. 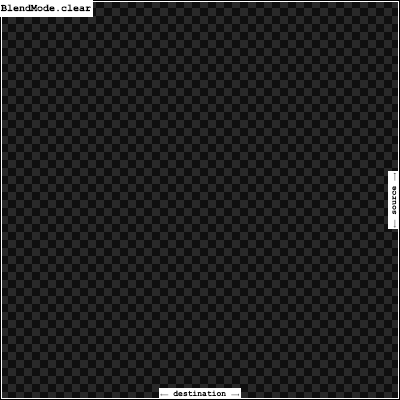 When drawing a shape or image onto a canvas, different algorithms can be used to blend the pixels. The different values of BlendMode specify different such algorithms. Each algorithm has two inputs, the source, which is the image being drawn, and the destination, which is the image into which the source image is being composited. The destination is often thought of as the background. The source and destination both have four color channels, the red, green, blue, and alpha channels. These are typically represented as numbers in the range 0.0 to 1.0. The output of the algorithm also has these same four channels, with values computed from the source and destination. The documentation of each value below describes how the algorithm works. 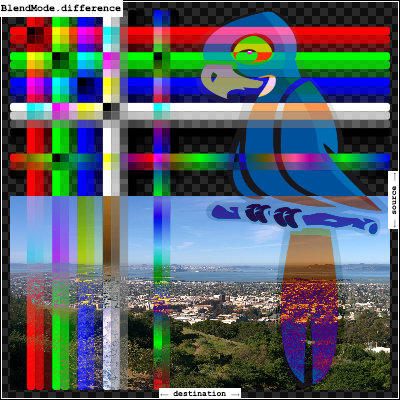 In each case, an image shows the output of blending a source image with a destination image. In the images below, the destination is represented by an image with horizontal lines and an opaque landscape photograph, and the source is represented by an image with vertical lines (the same lines but rotated) and a bird clip-art image. The src mode shows only the source image, and the dst mode shows only the destination image. In the documentation below, the transparency is illustrated by a checkerboard pattern. 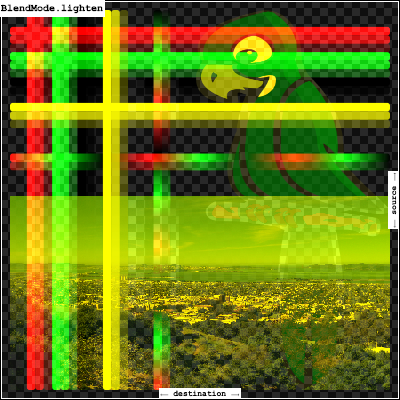 The clear mode drops both the source and destination, resulting in an output that is entirely transparent (illustrated by a solid checkerboard pattern). The horizontal and vertical bars in these images show the red, green, and blue channels with varying opacity levels, then all three color channels together with those same varying opacity levels, then all three color channels set to zero with those varying opacity levels, then two bars showing a red/green/blue repeating gradient, the first with full opacity and the second with partial opacity, and finally a bar with the three color channels set to zero but the opacity varying in a repeating gradient. 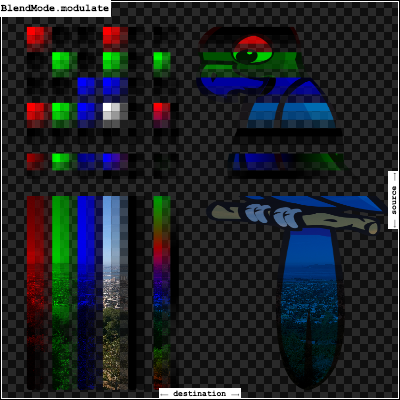 Paint.blendMode, which uses BlendMode to define the compositing strategy. Drop both the source and destination images, leaving nothing. This corresponds to the "clear" Porter-Duff operator. Take the hue and saturation of the source image, and the luminosity of the destination image. The effect is to tint the destination image with the source image. 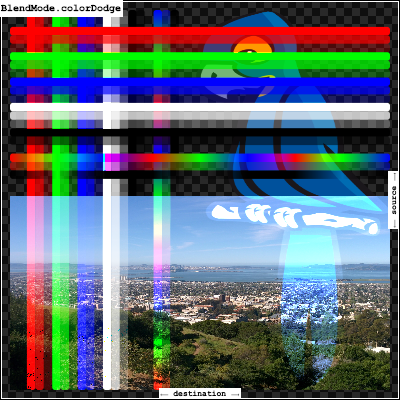 The opacity of the output image is computed in the same way as for srcOver. 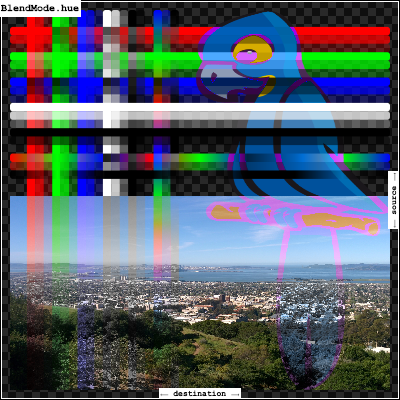 Regions that are entirely transparent in the source image take their hue and saturation from the destination. hue, which is a similar but weaker effect. softLight, which is a similar tinting effect but also tints white. 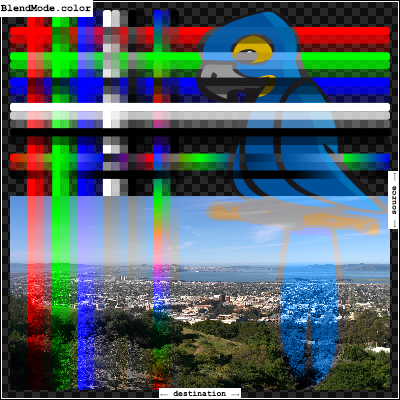 saturation, which only applies the saturation of the source image. Divide the inverse of the destination by the the source, and inverse the result. Inverting the components means that a fully saturated channel (opaque white) is treated as the value 0.0, and values normally treated as 0.0 (black, transparent) are treated as 1.0. Divide the destination by the inverse of the source. 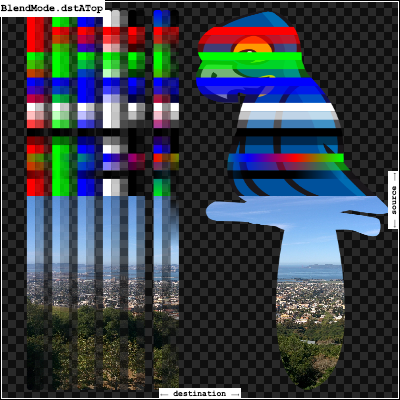 Composite the source and destination image by choosing the lowest value from each color channel. The opacity of the output image is computed in the same way as for srcOver. Subtract the smaller value from the bigger value for each channel. 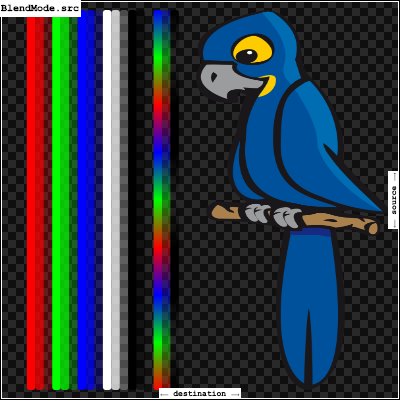 Compositing black has no effect; compositing white inverts the colors of the other image. The effect is similar to exclusion but harsher. Drop the source image, only paint the destination image. Conceptually, the source image is discarded, leaving the destination untouched. This corresponds to the "Destination" Porter-Duff operator. Composite the destination image over the source image, but only where it overlaps the source. This corresponds to the "Destination atop Source" Porter-Duff operator. This is essentially the dstOver operator, but with the output's opacity channel being set to that of the source image instead of being a combination of both image's opacity channels. For a variant with the source on top instead of the destination, see srcATop. Show the destination image, but only where the two images overlap. The source image is not rendered, it is treated merely as a mask. The color channels of the source are ignored, only the opacity has an effect. To show the source image instead, consider srcIn. To reverse the semantic of the mask (only showing the source where the destination is present, rather than where it is absent), consider dstOut. This corresponds to the "Destination in Source" Porter-Duff operator. Show the destination image, but only where the two images do not overlap. The source image is not rendered, it is treated merely as a mask. The color channels of the source are ignored, only the opacity has an effect. To show the source image instead, consider srcOut. To reverse the semantic of the mask (only showing the destination where the source is present, rather than where it is absent), consider dstIn. This corresponds to the "Destination out Source" Porter-Duff operator. Composite the source image under the destination image. This is the opposite of srcOver. This corresponds to the "Destination over Source" Porter-Duff operator. This is useful when the source image should have been painted before the destination image, but could not be. Subtract double the product of the two images from the sum of the two images. The effect is similar to difference but softer. Multiply the components of the source and destination images after adjusting them to favor the source. Specifically, if the source value is smaller, this multiplies it with the destination value, whereas is the destination value is smaller, it multiplies the inverse of the destination value with the inverse of the source value, then inverts the result. modulate, which always multiplies the values. screen, which always multiplies the inverses of the values. overlay, which is similar to hardLight but favors the destination image instead of the source image. Take the hue of the source image, and the saturation and luminosity of the destination image. 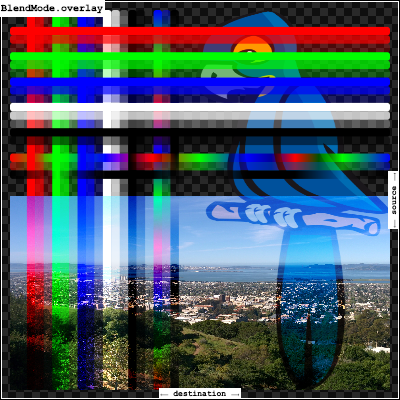 The opacity of the output image is computed in the same way as for srcOver. Regions that are entirely transparent in the source image take their hue from the destination. color, which is a similar but stronger effect as it also applies the saturation of the source image. HSVColor, which allows colors to be expressed using Hue rather than the red/green/blue channels of Color. Composite the source and destination image by choosing the highest value from each color channel. Take the luminosity of the source image, and the hue and saturation of the destination image. 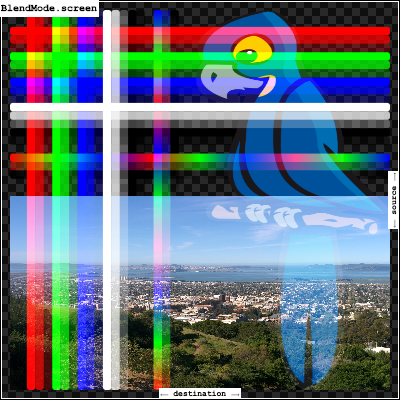 The opacity of the output image is computed in the same way as for srcOver. Regions that are entirely transparent in the source image take their luminosity from the destination. saturation, which applies the saturation of the source image to the destination. 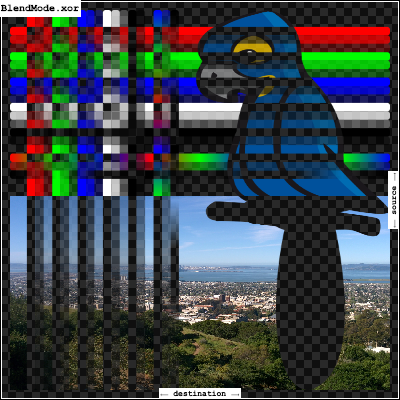 ImageFilter.blur, which can be used with BackdropFilter for a related effect. Multiply the color components of the source and destination images. This can only result in the same or darker colors (multiplying by white, 1.0, results in no change; multiplying by black, 0.0, results in black). When compositing two opaque images, this has similar effect to overlapping two transparencies on a projector. For a variant that also multiplies the alpha channel, consider multiply. screen, which does a similar computation but inverted. overlay, which combines modulate and screen to favor the destination image. hardLight, which combines modulate and screen to favor the source image. Multiply the components of the source and destination images, including the alpha channel. 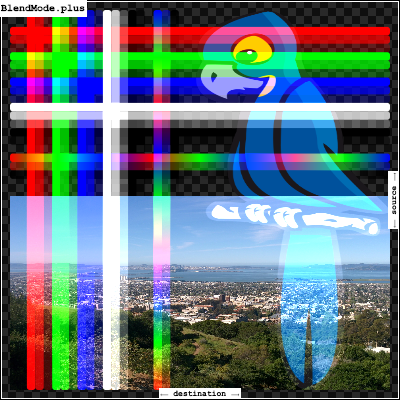 Since the alpha channel is also multiplied, a fully-transparent pixel (opacity 0.0) in one image results in a fully transparent pixel in the output. This is similar to dstIn, but with the colors combined. For a variant that multiplies the colors but does not multiply the alpha channel, consider modulate. Multiply the components of the source and destination images after adjusting them to favor the destination. Specifically, if the destination value is smaller, this multiplies it with the source value, whereas is the source value is smaller, it multiplies the inverse of the source value with the inverse of the destination value, then inverts the result. 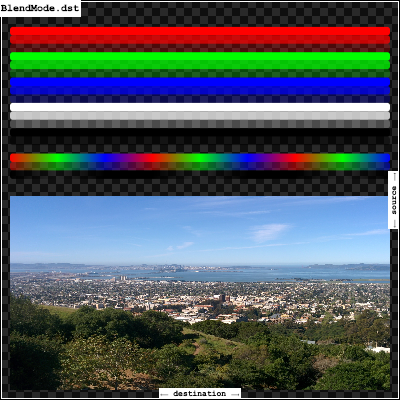 hardLight, which is similar to overlay but favors the source image instead of the destination image. Sum the components of the source and destination images. 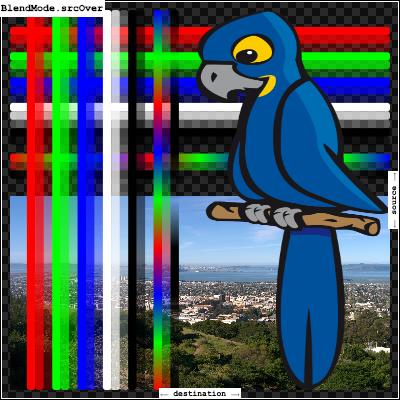 Transparency in a pixel of one of the images reduces the contribution of that image to the corresponding output pixel, as if the color of that pixel in that image was darker. This corresponds to the "Source plus Destination" Porter-Duff operator. Take the saturation of the source image, and the hue and luminosity of the destination image. The opacity of the output image is computed in the same way as for srcOver. Regions that are entirely transparent in the source image take their saturation from the destination. color, which also applies the hue of the source image. luminosity, which applies the luminosity of the source image to the destination. Multiply the inverse of the components of the source and destination images, and inverse the result. This is essentially the same as modulate blend mode, but with the values of the colors inverted before the multiplication and the result being inverted back before rendering. This can only result in the same or lighter colors (multiplying by black, 1.0, results in no change; multiplying by white, 0.0, results in white). Similarly, in the alpha channel, it can only result in more opaque colors. This has similar effect to two projectors displaying their images on the same screen simultaneously. modulate, which does a similar computation but without inverting the values. 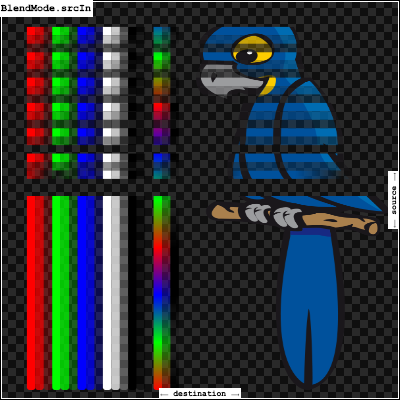 Use colorDodge for source values below 0.5 and colorBurn for source values above 0.5. This results in a similar but softer effect than overlay. color, which is a more subtle tinting effect. Drop the destination image, only paint the source image. Conceptually, the destination is first cleared, then the source image is painted. This corresponds to the "Copy" Porter-Duff operator. Composite the source image over the destination image, but only where it overlaps the destination. This corresponds to the "Source atop Destination" Porter-Duff operator. 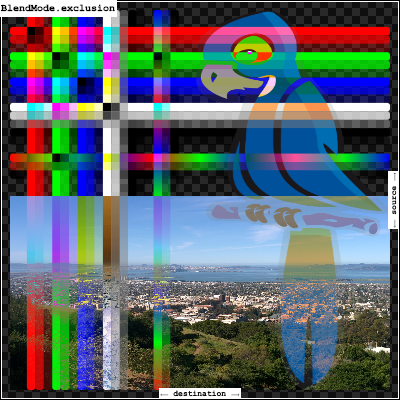 This is essentially the srcOver operator, but with the output's opacity channel being set to that of the destination image instead of being a combination of both image's opacity channels. For a variant with the destination on top instead of the source, see dstATop. Show the source image, but only where the two images overlap. The destination image is not rendered, it is treated merely as a mask. The color channels of the destination are ignored, only the opacity has an effect. To show the destination image instead, consider dstIn. To reverse the semantic of the mask (only showing the source where the destination is absent, rather than where it is present), consider srcOut. This corresponds to the "Source in Destination" Porter-Duff operator. 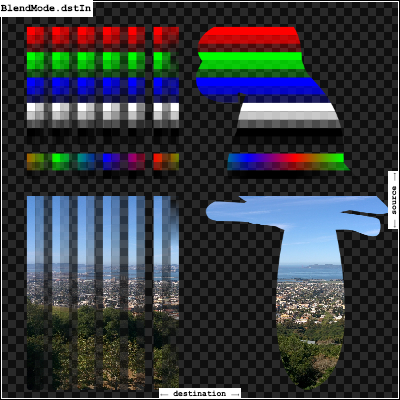 Show the source image, but only where the two images do not overlap. The destination image is not rendered, it is treated merely as a mask. The color channels of the destination are ignored, only the opacity has an effect. To show the destination image instead, consider dstOut. To reverse the semantic of the mask (only showing the source where the destination is present, rather than where it is absent), consider srcIn. This corresponds to the "Source out Destination" Porter-Duff operator. Composite the source image over the destination image. This is the default value. It represents the most intuitive case, where shapes are painted on top of what is below, with transparent areas showing the destination layer. This corresponds to the "Source over Destination" Porter-Duff operator, also known as the Painter's Algorithm. 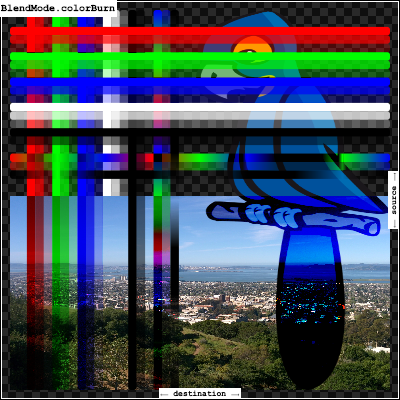 Apply a bitwise xor operator to the source and destination images. This leaves transparency where they would overlap. This corresponds to the "Source xor Destination" Porter-Duff operator.